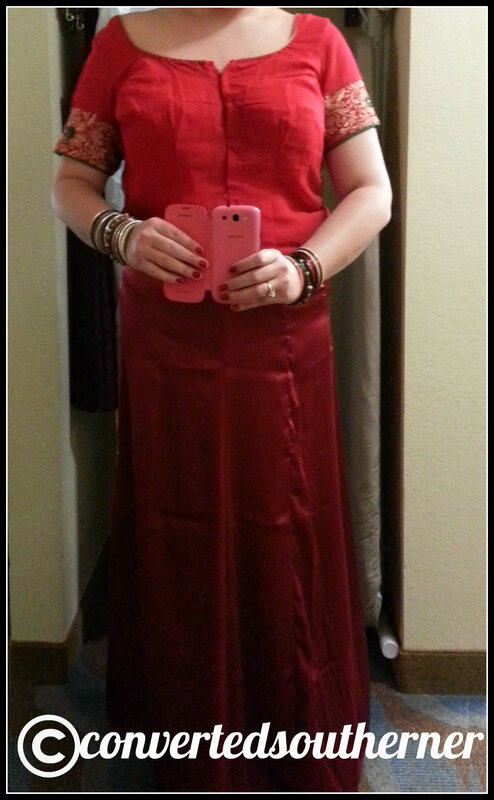 All dressed up in the bridesmaid sari and ready to go. THREE safety pins holding this! Luckily, I didn’t have to worry about where to get it. Her parents had them made for us, and paid for them. Apparently, this is common in this culture and I LOVED IT (I also love her parents and want to adopt them, but that is another topic). Her parents also covered our hotel, gifts and meals. 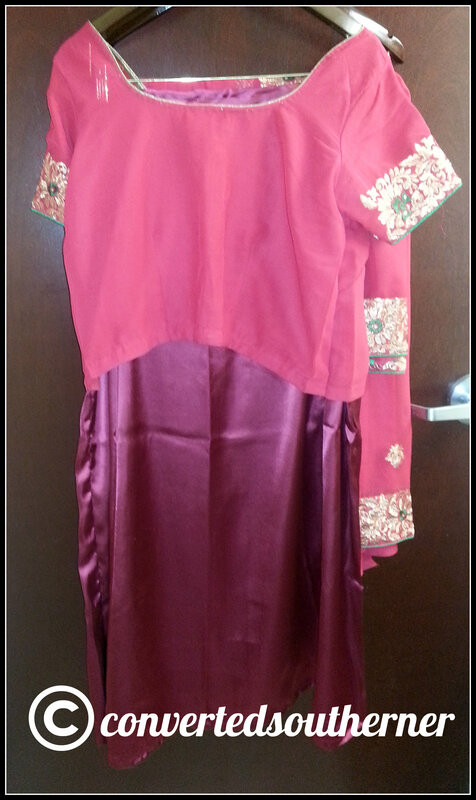 So the bridesmaid sari. I was like sure, as long as my stomach isn’t hanging out… just let me know if I need to go to a store and get sized. HA! A few weeks after this conversation, Pinkster sends me instructions on how to measure myself for the sari. IT WAS A 17 PAGE POWERPOINT. I kid you not. On two slides alone I had about 30 different front shirt styles. It was nice to have options. And it took a freaking hour to fill out! So- what is the sari made of? First, it was multilayered and the entire thing was wrapped and tucked and held up with THREE safety pins. Seriously. One of Pinkster’s aunts and a cousin came to the hotel at 7am to dress all the non-Indian bridesmaids who had never worn a sari before and had no earthly idea what to do with all this pretty material. 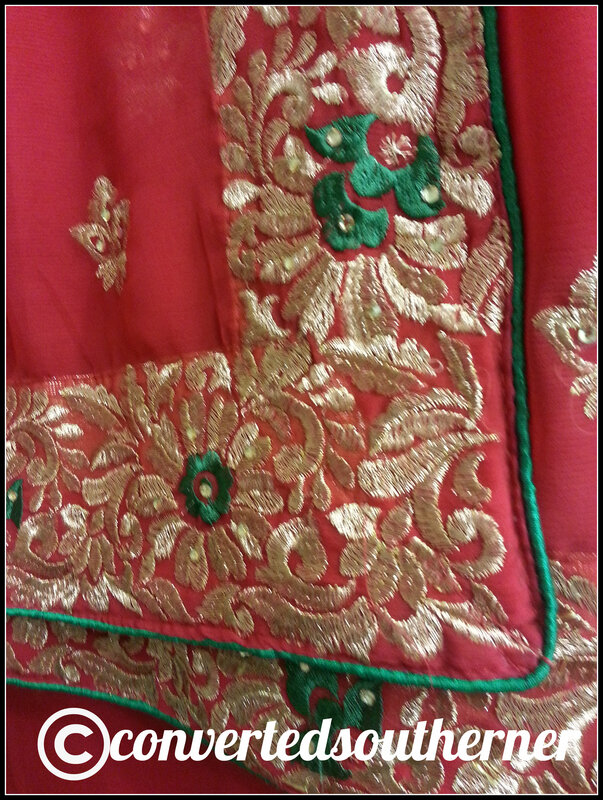 The saris were red with a lovely gold and green embroidery all around the edges. Bottom later: the petticoat. It was just a satin layer held up with a draw string. Blouse: We all got to choose the cut of our blouse. I wanted to be covered as humanly possible. I LOVE how body image is not as much as a focus in the Indian culture as it is in American culture, but I couldn’t shake my fears about showing my stomach! So I got a Horseshoe neck with sleeves. It was also October, so I didn’t want to be too cold. My blouse buttoned with little hooks completely up the front. 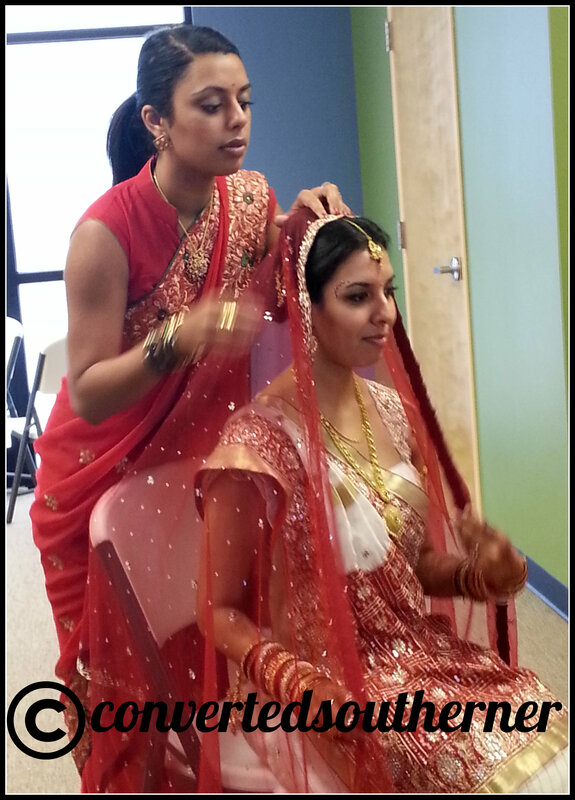 Actually, I didn’t get to try the sari on until the day before the wedding and it didn’t fit. Luckily, there were people in her family with excellent sewing skills, so they fixed it immediately. After the blouse and sari were on, the rest of the material was just completely wrapped around me with certain tucks and pulls. All held up with those tucks and three safety pins. 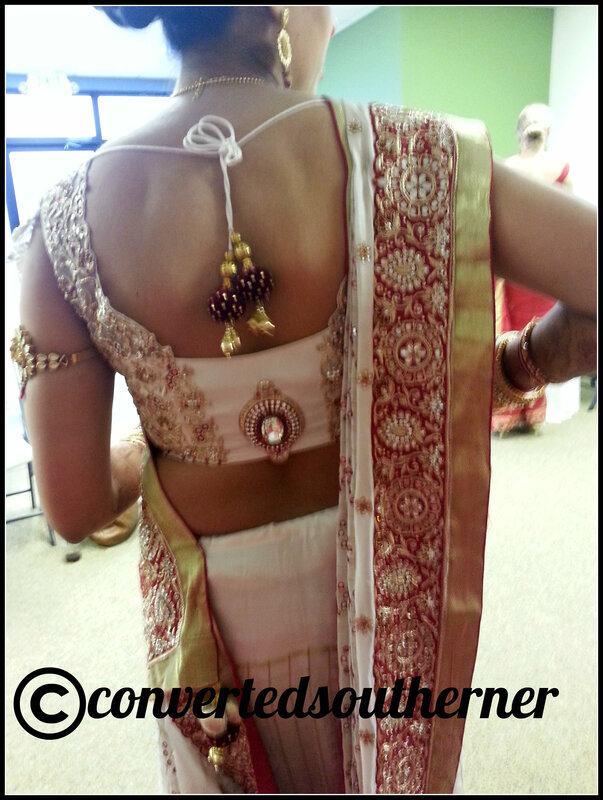 There was no going back… that sari did not come off until it was time to change into the second dress for the reception! 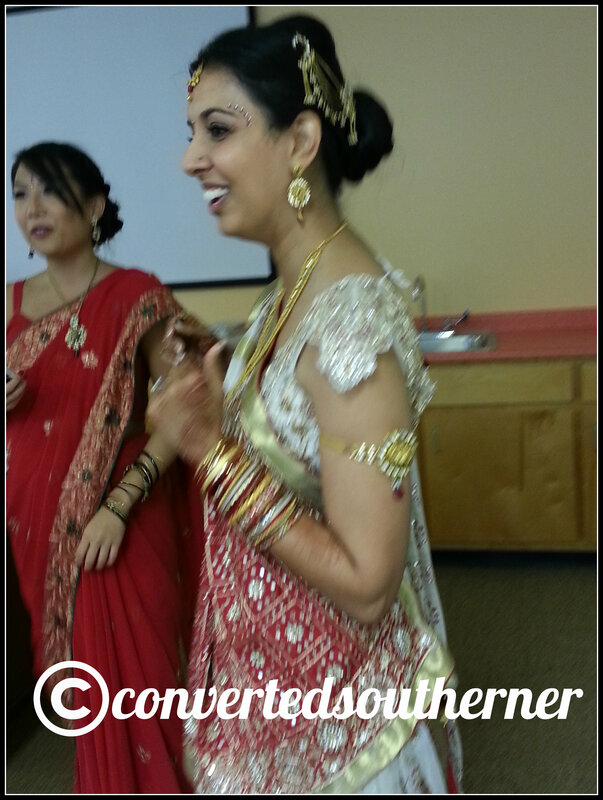 And finally, some pictures of the bride in her bridal sari. It was all white, red and gold. She was completely stunning!